The Pistons and Pacers share this entry with Malice at the Palace, the huge fight that broke out between the two teams on November 19 2004 during a game at the Pistons home court, the Palace of Auburn Hills. 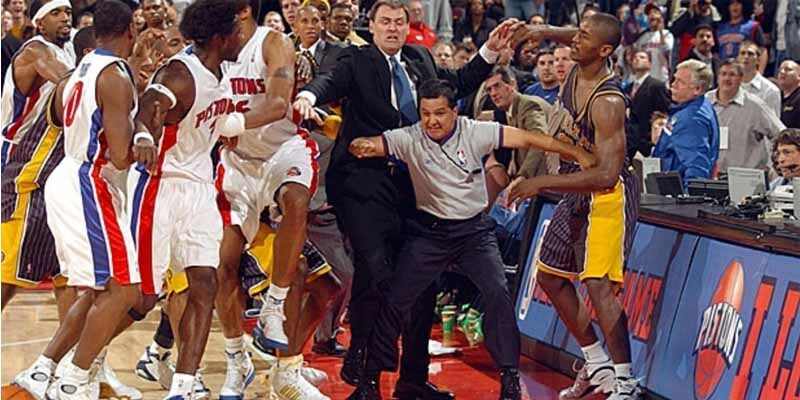 The brawl started with Pacers’ Ron Artest (Metta World Peace) and Pistons’ Ben Wallace after Artest hard fouled Wallace during a layup attempt with under a minute left. The proverbial feces hit the fan after a fan threw a drink at Artest, prompting Artest and Stephen Jackson to go into the stands and attack fans in retaliation.